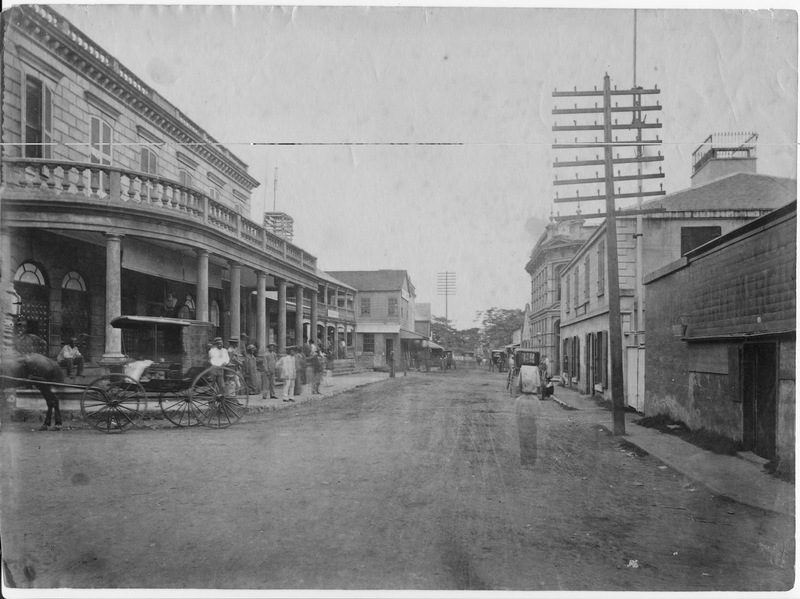 Once the main street of the financial and governmental functions in the city, Merchant Street was Honolulu's earliest commercial center. Dating from 1854, these buildings help tell the story of the growth and development of Honolulu's professional and business community. The variety of architectural styles depict the changing attitudes and living patterns during the emergence of Honolulu as a major city. The oldest commercial building in Honolulu, erected in 1854, is Melchers Building at 51 Merchant Street, built for the retail firm of Melchers and Reiner. Its original coral stone walls are no longer visible under its layers of stucco and paint, and it now houses city government offices, not private businesses. The Kingdom of Hawai‘i instituted a postal system in 1851, issuing 5 and 13 cent stamps for letters and a 2 cent stamp for papers. Operated as a private concession for many years, the postal service expanded its work in the 1860s. David Kalākaua, later Hawaii’s monarch, ran the service from 1862 to 1865. The Kamehameha V Post Office at the corner of Merchant and Bethel Streets was the first building in Hawaiʻi to be constructed entirely of precast concrete blocks reinforced with iron bars. It was built by JG Osborne in 1871 and the success of this new method was replicated on a much grander scale the next year in the royal palace, Aliʻiōlani Hale. In 1900, the old Post Office became a unit of the U.S. Postal System. Charles Reed Bishop moved to Honolulu in 1846; married Bernice Pauahi, in 1850; and Bishop started the first bank in Hawaiʻi, the Bishop & Co. Bank in 1858, The Bishop Bank Building at 63 Merchant Street was the earliest of the Italianate (or Renaissance Revival) structures on the street, built in 1878 and designed by Thomas J. Baker (one of the architects of ʻIolani Palace.) In 1925, Bishop Bank moved to much larger quarters along "Bankers Row" on Bishop Street, and later changed its name to First Hawaiian Bank, now the largest in the state. The building, now known as the Harriet Bouslog Building, houses the offices of the Harriet Bouslog Labor Scholarship Fund and the Bouslog/Sawyer Trusts. This site was the approximate location of the Oʻahu Bethel Church established in 1837. Reverend Samuel C. Damon (1815-1885) founded the English-language paper 'The Friend' in 1843 and ran the paper from this earlier site of the Seamen’s Bethel Church until his death in 1885. The Chinatown fire of 1886 destroyed the original Seaman’s Bethel building. In 1887, builder George Lucas, erected a single, two-story brick building on the makai (ocean) side of this double parcel to house The Friend and other papers, both English language and Hawaiian, printed by the Press Publishing Company. In 1862, the Hawaiian Government officially permitted the sale of “ardent spirits” after many years of typically unheeded suppression. An establishment selling alcohol to the many visiting sailors was located on this approximate site as early as 1873. The bar was only one of scores of similar establishments in Honolulu’s harbor area during the nineteenth century. In 1890, local barkeeper and investor Walter C. Peacock built and probably designed the Royal Saloon, one year after the widening of Merchant Street. At six stories, the Stangenwald building was considered Hawaii's first skyscraper and one of the most prestigious addresses in Honolulu. Designed by noted architect Charles William Dickey, construction of the steel-frame and brick building began in 1900 and the building was completed in 1901. This building is of the most modern style of fire-proof architecture, designed with completeness of office conveniences equal to that of any city." Honolulu's business community seemed to agree, for its prestigious address was claimed by several of Honolulu's most prominent company names: The Henry Waterhouse Trust Company, B F Dillingham, Castle and Cooke, Alexander & Baldwin and C Brewer Companies. The Stangenwald remained the tallest structure until 1950, when the seven-story Edgewater Hotel in Waikīkī took over that title. Dr. Gerrit P. Judd (1803-1873), a Protestant missionary who arrived in Hawai‘i in 1826, purchased the lot at the corner of Merchant and Fort Streets in 1861. The Judd Building, designed by Oliver G. Traphagen, boasted Hawaii's first passenger elevator when it opened in 1898. The building was the first home for the newly formed Bank of Hawaii, which remained on the ground floor until 1927, when the bank took over new premises on Bishop Street. A fifth floor was added on top in the 1920s. The name commemorates Dr. Gerrit P. Judd, who became a close advisor to Kamehameha III and served as a minister in government of the Kingdom of Hawai‘i. He was a central figure in the creation of Hawai‘i’s constitution and helped to negotiate the return of Hawaiian sovereignty from Great Britain in 1843. Overseas branches of the Yokohama Specie Bank (est. 1880) were chartered to act as agents of Imperial Japan. The Honolulu branch was the first successful Japanese bank in Hawaiʻi. The building at 36 Merchant Street dates from 1909 and was designed by one of Honolulu's most prolific architects, Henry Livingston Kerr, who considered it not just his own finest work, but the finest in the city at the time. The brick and steel structure is L-shaped, with a corner entrance and a courtyard in back. The bank purchased this property, previously occupied by the 1855 Sailor’s Home, in 1907. During its operation, the bank set aside separate reception areas for Japanese-speaking, Chinese-speaking and English-speaking customers. 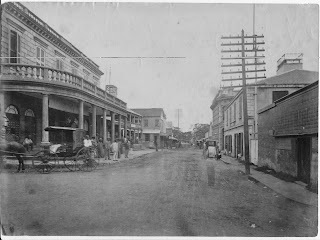 With one of the earliest police forces in the world, dating to 1834 and the reign of Kamehameha III (Kauikeaouli), the Kingdom of Hawaii had an earlier police station on King Street. The old Honolulu Police Station at 842 Bethel Street occupies the whole block of Merchant Street between Bethel Street and Nuʻuanu Avenue. Built in 1931, it replaced an earlier brick building on the same site that dated from 1885 (the new structure is also known as the Walter Murray Gibson Building.) At that time, the government also created a new Bethel Street extension, which linked Merchant Street to Queen Street. Architect Louis Davis designed it in a Spanish Mission Revival style that matches very well that of the newly built city hall, Honolulu Hale (1929.) It served as the headquarters of the Honolulu Police Department until the latter moved to the old Sears building in Pawaʻa in 1967. It was renovated in the 1980s and now houses other city offices. The image shows Merchant Street in 1885 looking toward Waikiki; Kamehameha V Post Office in left foreground, right rear Bishop Bank. I have added more images in a folder of like name in the Photos section on my Facebook page.